Home » Blog » Back to one of my favorite countries. Which one, you ask? In just a few days, I will be taking a flight from Madrid to Amman, the capital of Jordan. Jordan is one of my favorite countries in the world and I believe, though I might be corrected on this by friends with better memories than me, that this will be my fifth trip there. Simply put, Jordan has some of the nicest and friendliest people in the world. It is a country that I think will always hold a deep emotional connection for me because of things I have experienced and people I have known that have indelibly painted their warmth and love into my soul. And the best thing about that thought — it isn’t even 1% hyperbole. I’m headed back to Jordan to do more work with another set of folks I have come to love, the wonderful people at Cox and Kings. Hopefully you recall that I worked with them on some video content last year in Peru and I will doing some of that same work for them, in conjunction with the Jordan Tourism Board (more friends of mine, in case you aren’t sensing a trend today), over the next few weeks. In a few weeks, I’ll be posting videos to my YouTube channel from this trip — please click over and subscribe if you haven’t already, which you can do with just an email, you don’t need a YouTube account. Although I have been to Jordan a number of times, I have never shot video there, nor any time lapse, so I’m particularly excited to go back to a place I know so well and do the things I now love to do. When non-travel blogging friends of mine ask me for advice on places to visit, Jordan is on the short list of my recommendations for a variety of reasons. First, I love the Middle East. I love the culture. I love the people. I love the food. Mostly, I love the climate (though there are a few exceptions there). I love the history. It is one of my favorite parts of the world. Unfortunately, you can’t go to some of the places there that I dearly love, most obviously Syria. And although things have improved since I wrote this post about Egypt a few years back, I’m still don’t personally recommend it to friends. Not that you should travel to Jordan as the “only remaining alternative” in the Middle East. Far from it. Even if the region was 100% peaceful and safe (and to be clear, Jordan is completely safe and peaceful), I’d still have it on my short list of countries to visit. Iconic sights. Petra is simply one of the places in the world that you need to see before you die, along with Machu Picchu and Angkor Wat and some others. 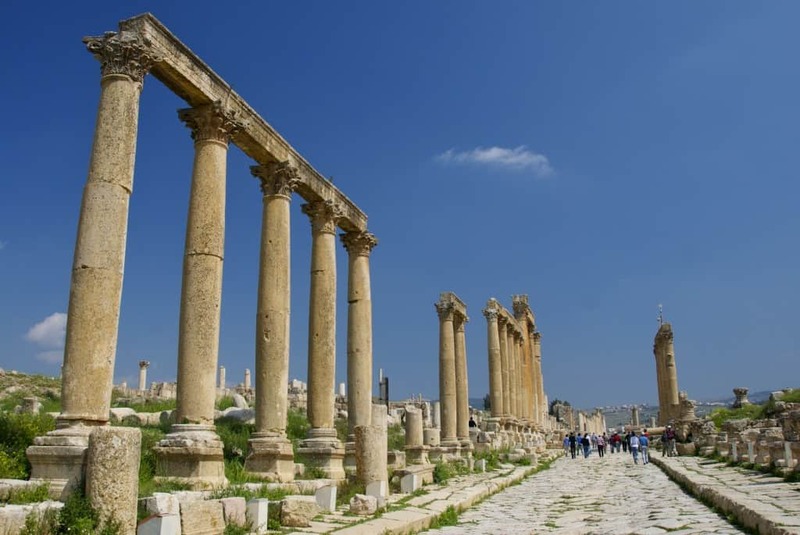 Aside from Petra, the Roman ruins at Jerash (photo above) are some of the best preserved in the world. The Dead Sea is, well, it is the Dead Sea — everyone has heard of it and everyone should float in it. Wadi Rum was the location for one of my favorite movies of all-time, Laurence of Arabia. And more. Jordan simply has a lot of great stuff to see. Easy to manage. One other thing I emphasize to friends is how easy Jordan is to manage in a 6-8 day trip. Most every thing you are going to want to see is on the western side of the country. Transportation is excellent and distances are not vast. You can see almost every sight you want to see there in about a week, without feeling rushed or hurried. The food. Look, I don’t write about food much because I’m simply not that good at it, but that being said, I love, love, love excellent food. You can’t do any better on the cuisine front, in my eyes, than what you will eat every day in Jordan. If I lived there I would be fat — and I strongly contemplated basing out of there at one point regardless. It would have been a happy fat. The hospitality. I already told you that Jordanians are some of the friendliest and nicest people in the world and it is most obvious in how they treat guests to their country. The number of people that opened the doors and hearts to me while I was there is something I will always cherish. I couldn’t be any happier about my next few weeks. Revisiting an old friend. And falling in love again, no doubt. Thanks for the great post! My partner and I have never been to the middle east in our travels and always thought we would make it to Egypt first. We planned on going to Egypt when we started traveling full time a few years ago. But by the time we got to the area it seemed best to save it for another time. This post has officially gotten me to set my sights on Jordan! I am on the fence on Egypt, but do really love it. But no qualms about recommending Jordan at all. Hope you get to get there soon. I have always heard good things about Jordan! Hope to visit it soon! Hope you do – such a lovely place and people. I used to think I would never go back to a place because there are too many I want to visit. But when a place really feels comfortable yet you feel there’s so much more to discover, it’s worth going back for more. Argentina and Nicaragua have been like that for me. Yea, I’m both ways on that. There are some countries I likely won’t be back to, but that list is a really short one. In fact, a post I need to do, now that I think of it. Even I want to visit Jordan in my lifetime. I agree, Petra is one of the iconic sites that shouldn’t be missed. Petra is simply one of the 5-6 places in the world that everyone should try to see at least once. I think about Israel for the same reasons you so eloquently point out on Jordan. It makes me want to go back. This time I will visit Jordan too. Thanks for your concise info in Jordan. I need to do a LOT more in Israel also. Was going to on this trip, but just ran out of time in the region. I’d love to visit Petra. I’d have never put it on the same priority list as Macchu Pichu or Angkor Wat, but you’re convincing me otherwise! Those are 3 of the ones that everyone should try to do once, in my opinion. Well, you’ve convinced me! I’ve always wanted to visit the Middle East. My dad was actually born in Iran. Looking forward to your posts and video, I subscribed! Thanks for subscribing! The videos are starting to come out now. And glad you are thinking about Jordan also. Enjoy!! Jordan was definitely one of my favorite countries to visit as well. We took a horseback tour through Wadi Rum, and camped with the Bedouins under the stars. Also got to do a Super Jeep tour of Wadi Rum, and of course, hiked Petra. It is such a stunning place, like another planet almost. And the people really were some of the most friendly I’ve met in any of my travels. So glad you get to go back and visit! Ahhhh, Wadi Rum. I really would love to go back and just hang out there for 3-4 days/nights at some point.